Overview: The theme of this new game is unusual enough to have players searching cyberspace for Greek mythology references! Ancient mythological creatures may provide the theme for this game, but there's nothing old-fashioned about this 5 reel, 25 pay-line video slot that can deliver between 15 and 25 Free Spins at a time with x3 multiplier punch and a re-trigger on the freebies Pegasus is the Scatter symbol here: get three and watch the free spins flow, tripling prizes and building winnings. Snake hips (and head) Medusa is Wild, helping to create winning combinations for the player. Players can bet as little as a 0.01 in the quest for big money. 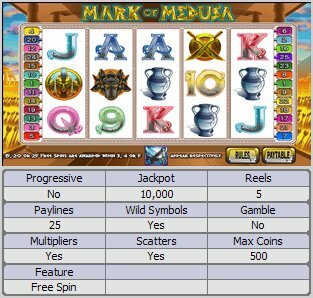 Similar Slots: If you like Mark of Medusa, you might like these other 5-reel slot machines: Big Kahuna : Snakes and Ladders, Pollen Nation, Scrooge, Sterling Silver, Summer Holiday, Worldcup Mania.